Advanced course on alchemical sequences. Over the past ten years or so I have been making handcoloured emblems by painting with watercolours copies of woodcuts and engravings from printed books and drawings from alchemical manuscripts. In colouring these I made use of my intensive study of the original coloured manuscripts of the 15th to 18th centuries, which have been the main focus of my research over many years. I have found that contemplation and meditation on these handcoloured images helps us resonate with and enter into the complex symbolic world of alchemy. In the autumn of 1999 I began to make these images available in the form of high quality prints that people could frame or use for study. 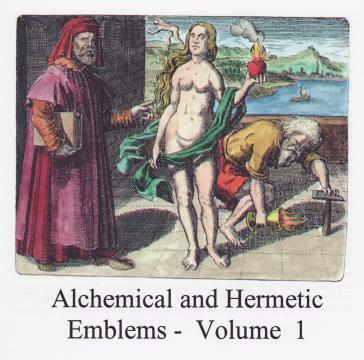 In late 1999 I began my e-mail study course on the interpretation of alchemical imagery and I drew upon this resource for the course lessons. For various technical reasons, and to protect my copyright, it was not possible for me to provide high resolution scans of these images on the alchemy web site. Sorry these CD-Roms are now discontinued.